Welcome Spring with a smile and a slice of this delicious and totally guilt-free dessert! You’re about to fall in love with this Mango tart with passion fruit yogurt mousse. Filled with refreshing and beautifully displayed mango slices, this easy tart recipe doesn’t take more than 15 mins to put it together and it’s packed with health benefits for your body. 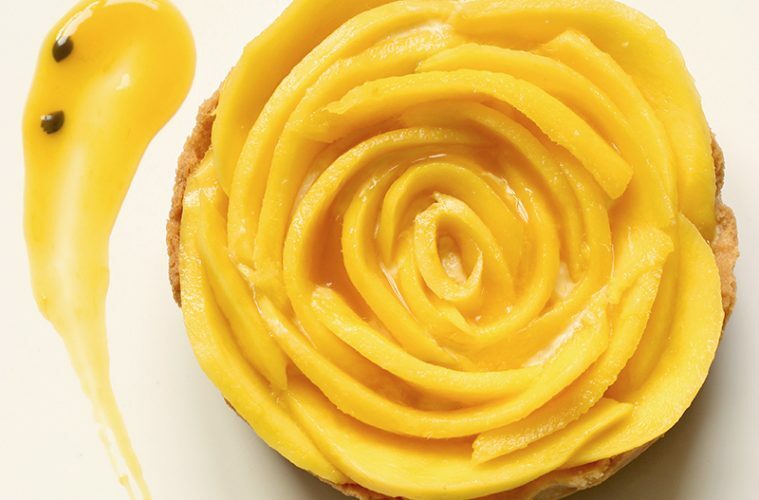 A crunchy and fragrant crust made with almond flour and agave nectar is the base for this simple yet impressive mango tart. You only need to mix together the ingredients, and then just tip the mixture on a small individual tart tin ( or a big one, depending the size you want the tart) and bake for 5 min, until crunchy and golden brown. To make the healthy and oh-so-good passion fruit mousse, simply mix the fruit pulp with light and compact Greek yogurt ( buy organic to get a very firm yogurt). Why choose Greek yogurt? First because it’s packed with probiotics, microorganisms that help protect our immune system and are great for the digestive system; second because it’s packed with vitamin B12. Vegetarians are often deficient in B12 because it’s generally found in meats, so Greek yogurt is an excellent, meat-free way to add more to your diet. The final touch is topping the tart with sweet and juicy perfectly-ripe mangoes. This super food makes an excellent choice, in fact mangos are packed with antioxidants and vitamin C, both vital for a healthy and fit body. In a nutshell, having a mango a day keeps the doctor away. 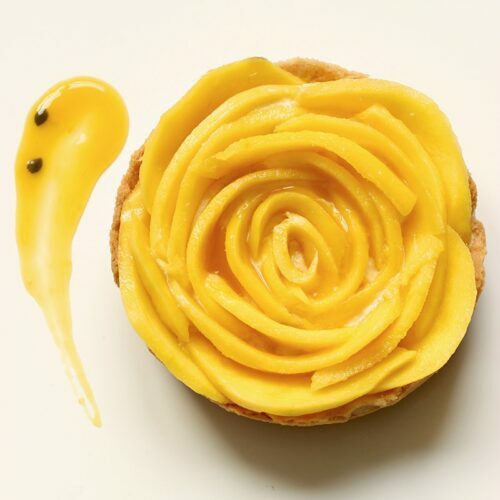 Arranging the mango slices to form a rose is a super easy and pretty way to decorate the tart. To make it, simply start lining the mango slices from the bottoms to the center, in a circular way. This mango tart with passion fruit mousse makes also the perfect balanced breakfast, securing you two of your 5 a day, plus all the health benefits it comes with! Welcome to a new era where healthy desserts actually exist and are super good for you! Enjoy more healthy dessert recipes for every day of the week! Welcome Spring with a smile and a slice of this delicious and totally guilt-free mango tart with passion fruit mousse! Transfer the mixture in a no-stick 9-inch tart pan ( or 4 small individual tart tins) with a removable bottom. Using a measuring cup or your fingers, evenly press the almond mixture in bottom and up sides of pan. Bake in center of oven until golden and firm, about 5 minutes. Transfer to a wire rack to cool completely. In the meantime prepare the filling. In a small saucepan sprinkle the gelatin over ¼ cup cold water and mix, then heat the mixture over low heat, stirring, until the gelatin is dissolved. In a bowl, mix together passion fruit pulp with yogurt, then add the gelatin mixture. Leave it natural or add honey to make it sweeter. Fill ⅔ of each tart with passion fruit mousse. Starting with the longest strips of mango, place the slices around the edge of the tart. Repeat until you reach the center, slightly overlapping the rows. Keep refrigerated until serving, and enjoy! The recipe amounts are for a 9-inch tart or 4 small individual ones.